Ubud Tour is a one day trip itinerary to visit the best attractions in Ubud Bali such as Ubud Monkey Forest (Sacred Monkey Forest Sanctuary), Ubud Palace, Ubud rice fields (Tegalalang rice terrace) and Pura Taman Saraswati temple (Lotus temple). If you would like to find out how to spend a day in Ubud or what to do in Ubud for 1 day then this full day Ubud Tour Itinerary could be on your bucket list. The full day Ubud tour is one of the top Bali one day trips itinerary for 9 hours to 10 hours to experience the most popular and best spots in Ubud Bali Indonesia. The Ubud day trip itinerary is a choice of some of the best points of interest in Ubud that we summarize into a day tour to complement your holiday in Bali island. Ubud is a town and part of the Gianyar regency's territory on the island of Bali, Indonesia, it is found among rice paddies and sheer ravines for the most part foothills of the Gianyar regency. Ubud is recognized as Bali's foremost arts and culture points and one of the greatest travel destinations in Bali island. Ubud has grown a major tourism sector. Combined with that, there are lots of readily available magazines and articles or reviews relating to Ubud travel guide to encourage holiday-makers discovering the interesting places and the best things to do in Ubud, Bali, Indonesia. Ubud has a population of more or less thirty thousand people. Recently, it has come to be challenging to comprehend the town alone from the villages which are around it. The parts around the town encompass few farmlands, rice fields, as well as lush woodland. Below is the itinerary and activities of the Ubud one-day excursions with the options of most toured sightseeing attractions in Ubud Bali from Balitourify. Make sure you pointed out that the Ubud day trip is a private tour and it's adjustable, it means that you are able to skip the spots which you do not prefer to visit and we can easily replace to other places but still in the destination of the surrounding Ubud region with the same duration of time offered. Take a look at our Bali half day tours offers if you require preferring for other available programs of tours in Bali in a short-day. Ubud trip is accompanied by our qualified & welcoming Balinese tour driver with a comfy vehicle for traveling. The first place to visit on the Ubud one day tour itinerary is Batubulan village to watch Barong dance performance. Batubulan is a village located in Gianyar regency, Bali, approximately 20 minutes from Ubud downtown. Initially, Batubulan is famous for handicraft carvings, but along with the rapid development of tourism in Bali, the community in the village of Batubulan then develop the art of Barong and Keris dance to be performed for the travelers who come to Bali. Actually Barong Dance is a traditional and very sacred Balinese dance performance, usually danced during the ceremony at the temple, in some villages in Bali, Barong dance is much danced to expel negative energy and to bring prosperity. 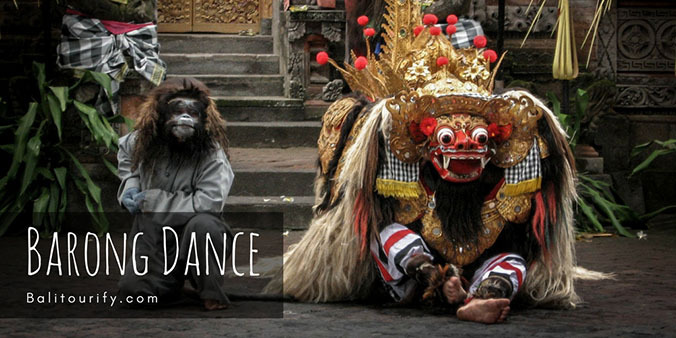 Barong Dance is a dance drama that tells about a fight between eternal good and evil. Barong is a figure that resembles a lion that is a symbol of goodness, while Rangda (The Barong's opponent) is a queen who is the leader of all evil beings. The battle between Barong and Rangda is the theme in the overall Barong dance show. The second place to visit in the Ubud day tours program is the village of Batuan located approximately 15 minutes from downtown Ubud. Batuan Village is a place in Bali that is famous for its artistic style of painting, there are some communities that support the existence of painters from this Batuan village. To keep the paintings from Batuan constantly growing, the community in Batuan has created several painting galleries to show or sell to fans of paintings and tourists. 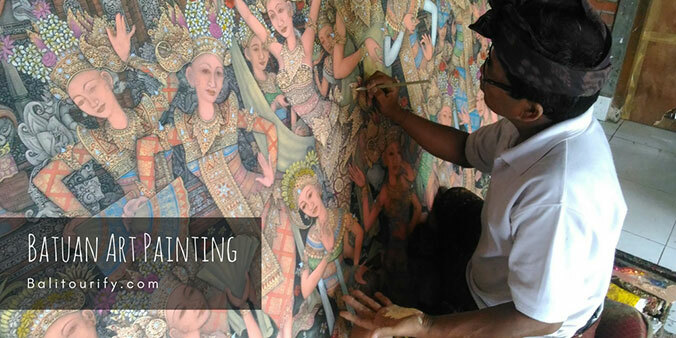 On this Ubud tour itinerary, we will visit a gallery where there are paintings that have been made by painters from the village of Batuan. The third place to explore on this Ubud day trips is the sacred monkey forest sanctuary. The Ubud Monkey Forest is found within the village of Padangtegal, Ubud, Gianyar, Bali. The Ubud's local people deem the Monkey Forest as a valuable spiritual, educational, economic, and conservation central part of the community. There are a variety of interesting marks that you may see here. Aside from around 700 monkeys, furthermore you will discover the 186 varieties of trees in 12.5 hectares of forest, whereby would offering you to gain a rich of breeze and fresh air. The species of monkeys which exist in Ubud Monkey Forest typically known as the Balinese long-tailed macaque, in scientific labeled as Macaca fascicularis. There is actually an average of 600 monkeys inhabiting Ubud Monkey Forest. They are divided into five groups, every single one of the group covering separately territory. 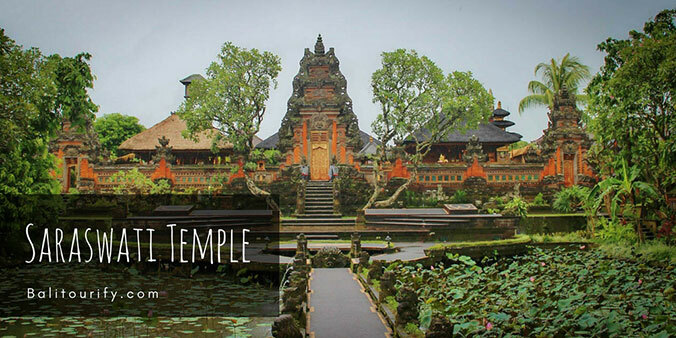 The fourth spot to visit on the Ubud one day itinerary is The Saraswati temple located right in the center of Ubud town. The Saraswati temple is a wonderful water temple where there is a pond loaded with lotus plants set in the downtown area of Ubud, Bali. Moreover, Saraswati Temple (Pura Taman Saraswati) is a lot furnished by carving rocks expressing the artistic creativity of the local people of Ubud Village. Saraswati Temple is one of the Hindu temples in Bali island built in the 19th century on the commands of the Ubud's royal family to adore the Goddess Saraswati (The Goddess of Knowledge). The following site to go to in the Bali Ubud tour schedule is to see the Ubud Palace. 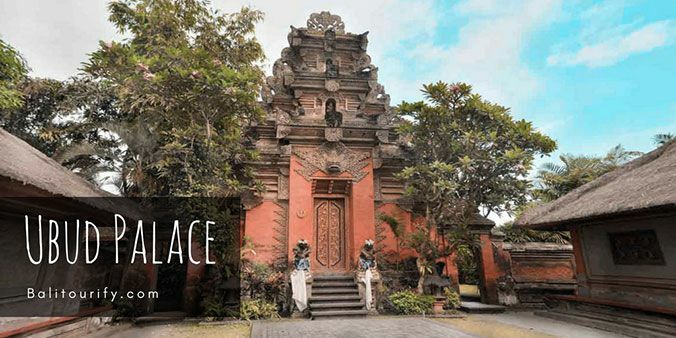 Puri Saren Agung is a Ubud Royal Palace found within the hub of Ubud and preferred to be a must-see place that currently visited by a mass of tourists day to day. Ida Tjokorda Putu Kande is the founder of the Ubud Kingdom who controlled the kingdom from 1800 – 1823. Ida Tjokorda Gde Agung Sukawati has made his palace to be offered as a place to stay for his guests of honor. Ubud Palace is an essential of art and societies while the market which is on the front part of it becoming a center of local community’s economy. In 1928, the Tjampuhan Hotel was developed for the royal guests and in 1934, the hotel was selected as the accommodation for the royal guests and also used as the activity midpoint of Pita Maha Group. The Tjampuhan Hotel is the very first hotels in Ubud with a classical design and style. 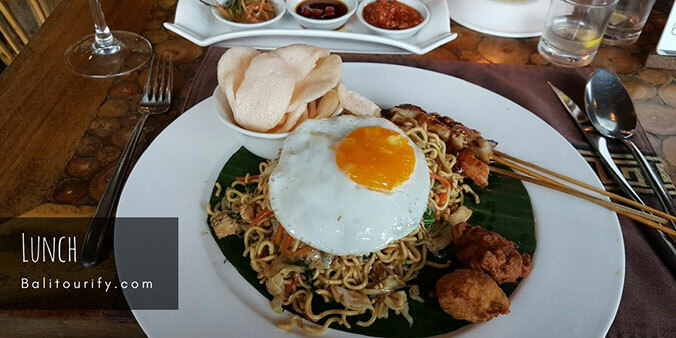 We will stop at a local restaurant for lunch, we will take you to a nice and standard place to have lunch with the local menu (generally Indonesian menu). You can take a break while enjoying your lunch with a nice ambience and cool breeze. We will take a break for 1 hour before we continue to the next location in the itinerary. 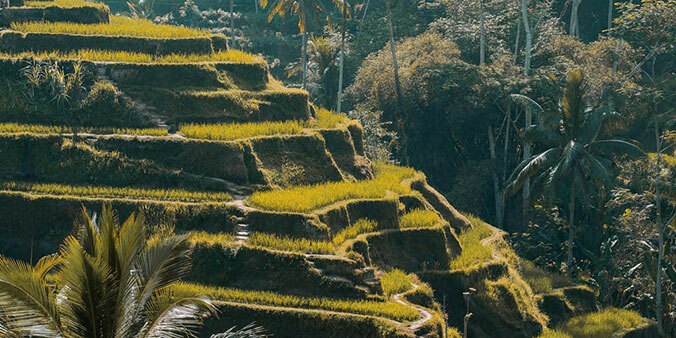 The next destinations to explore in the Ubud sightseeing tour program is the famous and wonderful Ubud rice fields, it is known as Tegalalang rice terraces. It is one of the most renowned tourist areas in Bali island discovered within Tegalalang Village north of Ubud, Bali, spotlighted by the marvelous rice terraces developed on the slope. Tegalalang Village lies on more or less six hundred meters above sea levels wrapped by the perfect range of weather conditions which is where the nearly all of the local villagers as the farmer and landowner. Tegalalang Rice Terrace in Ubud is widely recognized for its aesthetic clips of rice paddies affiliated to the Subak (the classical Balinese irrigation method), which derived from ancient periods, was completed by a reputable holy priest named Rsi Markandeya in the 8th century. Tegalalang outlines the three most remarkable terraced outlook in Ubud's stated area, with the all other parts listed in the villages of Campuhan and also Pejeng village. The Tegalalang rice fields alone provides a picturesque sight of the rice paddies on the slopes of the hill across the valley. It's a prestigious spot for holiday goers to stop for making beautiful photos. The painters, photography lovers, and the nature fanatics definitely embrace staring at this location, additionally, there are numerous art kiosks as well as cafes nearby the countertop selling their ware. 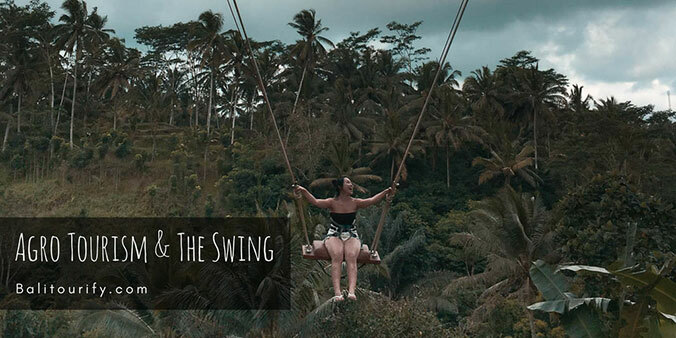 The last destination that we are going to visit on this Ubud Bali tour is The Agro Tourism and The Swing which is not far from Tegalalang rice terraces. Here you will be able to see various types of herbal plants for health such as various herbal teas and also Luwak coffee/Civet coffee (one of the finest coffees in the world). For the herbal teas itself, you can try to taste more than 10 different type of herbal teas for free (free of charge). For the Luwak coffee, it will be charged for IDR 50,000/cup (around 3,5 USD), it is a reasonable price due to the traditional process and expensive to harvest. Additionally, in this place, you are able to rent and play a swing which is perfect for those of you who like selfie and Instagram photo shoots. The inclusions and exclusions of Ubud One Day Tour. General information of the entrance fees and the opening hours of the attractions on the itinerary of Ubud One Day Tour. The Pick-up time and location of The Ubud Full Day Tour. Below are the common things to bring on The Ubud Full Day Tour. We accept cash payment for The Ubud One day Tour. You can pay directly to our driver on the same day of the tour. You are free to cancel the booking of The One Day Ubud Tour. You must inform us in one day before the tour (24 hours earlier) for the cancellation. Below are the numerous commonly asked questions relating to The Full Day Bali Ubud Tour, please contact us for more info. What's included in the Full Day Ubud tour? What is NOT included in the Bali Ubud One Day Trip? It does NOT include lunch, entrance fees for visiting tourist attractions, entrance tickets for watching the Barong dance performance. Is the price listed in The Full Day Ubud Tour for per person or per vehicle? The price listed in the one day Ubud Tour is per vehicle (NOT per person), our vehicle capacity is maximum 6 persons. If you book the full day Ubud Tour for 1 person or maybe 6 persons then the price will be the same (IDR 500,000). What to bring on the One Day Ubud trips? You may use easy casual wear, bring a bottle of mineral water to stay away from dehydration (Bali island offers high humidity), sun-screen to protect against skin burns (Bali is hot), cash money (for lunch, entrance tickets or shopping), sunglasses, smartphone/camera, medicine (if in treatment). How much is the ticket for watching the Balinese Barong dance performance? IDR 100,000 /person is the cost of the ticket to watch the Balinese dance show of Barong at Batubulan Village (updated 2018 - 2019), you could pay it directly on the location. 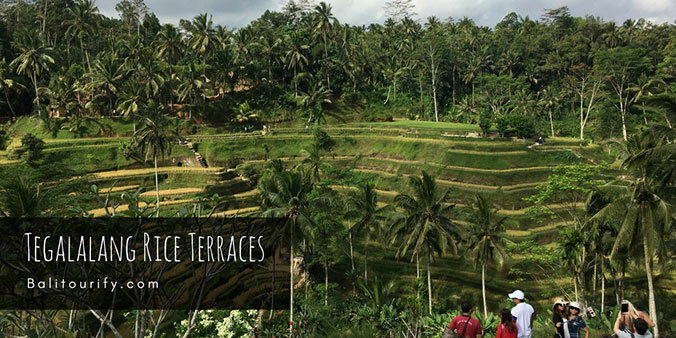 How much is the entrance fee to visit The Tegalalang Rice Terrace? IDR 10,000 /person is the entrance fee to visit the Tegalalang Rice Terrace (valid for 2018 - 2019, the fee may change with no prior notice). 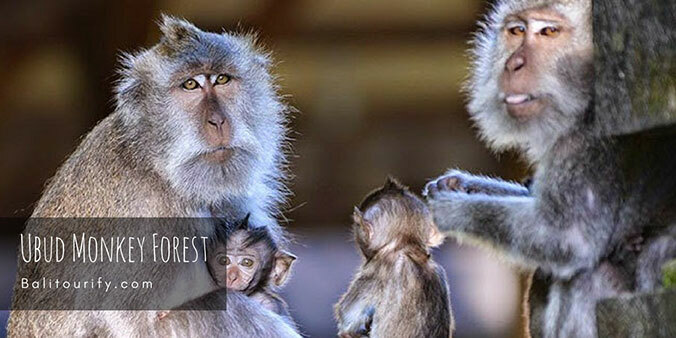 How much is the admission fee to visit Ubud Monkey Forest? IDR 50,000 /person (adult) and IDR 30,000 (children) is the entrance fee to visit the Ubud Sacred Monkey Forest Sanctuary (valid for 2018 - 2019, the entrance cost may change with no prior notice). Do not touch the monkey (it's not advised for your own safety), although they are definitely friendly but sometimes they may attack in times when they are disturbed (specifically female monkey with its baby), and please be aware of your own personal belongings (handbag, glasses, phone, hat, camera, wallet, etc) so as not to be taken away by monkeys. Generally, monkeys will not come across you unless you carry bananas or other kinds of food. If you would like to feed them, make sure to do it right carefully. If you are offering bananas or foods to the monkey and they came to take it, you must never attempt to pull it back. To keep the monkey’s healthiness, several types of food like bread, peanuts, candy, biscuits, or other kinds of human snacks are strictly prohibited to offer to the monkeys. How much does it cost to play a swing? They will charge you IDR 200,000/person to play a swing (The price is valid for 2018 - 2019, it might change without any prior notice). I would like to do the Ubud One Day Tour, how do I book? You can easily fill your details in the Book Now tab below to reserve the full-day Ubud tours. You can also send us an email or at this page to book this tour or any other day trips and also activities by mentioning the "ID" which is listed in every tour offer on our website (for example, UBT-01 is the ID for the One Day Ubud Tours) and you must book no less than one day in advance. How do I pay for the Ubud Full Day Tours and how much does it cost? At the moment, we accept the payment in cash money, the cost is 500,000 IDR (Indonesian Rupiah), you could pay directly to our driver who comes with you on this tour. We are going to convert the price depending on the daily exchange rate if you want to pay in another foreign currency. Keep in mind that the price of the Ubud Trip is per vehicle (it is NOT per person). How do I cancel the booking of this One Day Ubud Tour? You are free to cancel the booking of this One Day Ubud Tour with no cost, but you must notify us about the cancellation at least one day in advance by sending us an email or calling to our contact number.